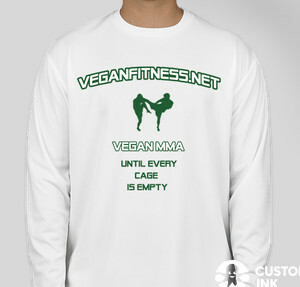 • View topic - Veganfitness.net Rash Guards? Like other threads elsewhere on the board, would any of you be interested in purchasing one or more VF rash guards?? There is a 6pc minimum order with the cost decreasing drastically as the quantity goes up. I love the strapline, clever! I'd like one but I'd prefer something else then the vegan logo on the back. [quote=".flux"]I love the strapline, clever! I love the idea of a vf.net rashguard and would definitely buy one or two. I would prefer a more discreet design though. 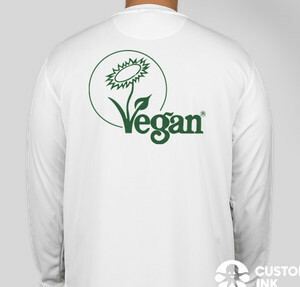 Hoffs idea about removing the vegan logo from the back I like. I would also like to have veganfitness.net printed down the arms. Whatever design you make though, unless it is really hideous I will buy one . Yeah I was at a loss for a back design and I didn't want it to just have writing everywhere so I slapped the logo up. Totally flexible; we can have it be whatever we want. [quote="bronco"]I would also like to have veganfitness.net printed down the arms. This particular company recently added the ability to print down the arms, but they have yet to add potential designs to their preview image. If we went with them, we could get sleeve printing, too. I'm sure size could be a factor in tightness. [quote="fist of doom"]long sleeve only? Keep the ideas coming and i'll keep trying to find something suitable for us all. Before I continue, is UnderArmour the consensus "best" rashguard you've used? aha, so these rash guards are nothing more special than under armour type things, but just tight and cover your whole upper body? in that case i will get one too Love to wear stuff like that sometimes under my training shirt when cold, to regulate the temp. ralf who ran the BJJ class at the melbourne vegan fitness and eating week was wearing underarmour i think. Mint! as it is looks top! i have never had a rash guard as most of them are not too my liking but i would go for one of these..
"Resistance to the organised mass can be effected only by the man who is as well organised as the mass itself"
LOVE the idea, dislike your concept of the rashguard. Sorry!